What about the tuxes? Hannah J. After months of planning and thought filled decisions regarding decor, dresses, and drama it seems like tuxes are one of the last things the bridal party worries about. Just as wedding dresses are the traditional attire for a bride tuxedos are the traditional attire for the groom and his groomsmen, and while wedding dress styles have morphed drastically over the decades tuxedos seem to have remained generally the same aesthetically speaking. Although, recently we have been seeing some “out of the box” colors and textures for the tuxedos, we have yet to see a consistent change in the typical wedding tux. Tuxedo’s are easily overlooked when planning a wedding and can sometimes become very stressful when deadlines need to be met as the wedding day approaches. If you are planning on renting your tuxes there are some key things to remember that will help make the process less stressful and more enjoyable. First, after you decide your wedding’s color scheme and finalize the bridesmaid dresses start to develop an idea of what style of tux you want. The tux style should complement the bridesmaid dresses. Make sure to get a swatch of your bridesmaid dress color to incorporate this color properly into the tux and be sure to pick your rental company carefully. Take your time, make an appointment to pick out tuxedos and don’t be afraid to ask questions or explore your options. When choosing a tux the small details are what make the tux unique. 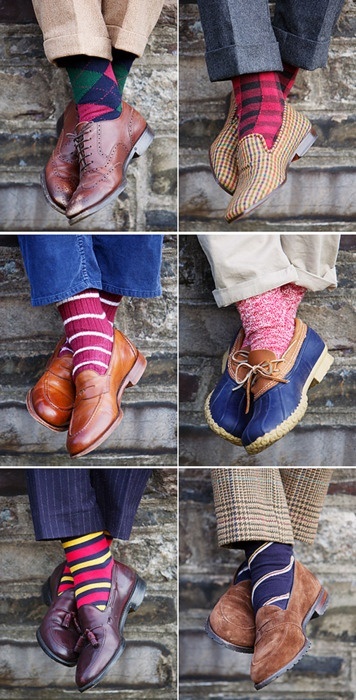 For example, to add some flair and a pop of unexpected color have each groomsmen wear a sock style that reflects their own personality within reason keeping the wedding color scheme in mind. Or, let the guys have some freedom with their ties. Provide them with swatches of the specific colors and let them find a tie. 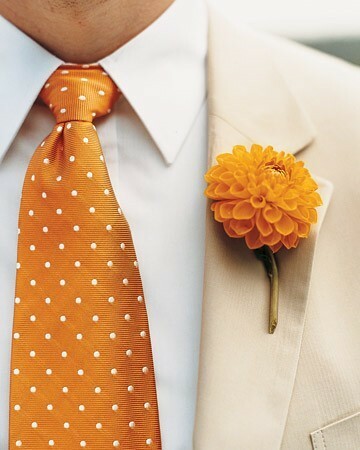 The boutonniere is another very important element, instead of matching the tux vest color to the bridesmaids change it up and match the boutonniere. This natural color detail can add that extra punch to the unique value of the tux. Keeping the vest a neutral color or skipping the vest all together is a small change that gives the tuxedo appearance a slightly different feel. Today, we are seeing an increasing trend with more casual weddings. Some Groomsmen parties are actually opting out of renting tuxes and throwing together their own ensembles. If this is the route you take, more power to you! Just remember to keep it clean, be sure to maintain a structured look when putting together the groomsmen because it is very easy to lose the tasteful formality for the groomsmen. Guys, don’t be afraid to dress outside of the box, push the limits and wear something that reflects your personality! This entry was posted in Hannah J. and tagged Creative, Hannah J., Ideas, Shopping, Tuxedo and Suit Rentals, Unique, Wedding, Wedding Dress/Gown by Affairs by Brittany. Bookmark the permalink.